Former Ireland international Ronan O'Gara has doubled down on his Joey Carbery and Beauden Barrett comparison. O'Gara, an assistant coach with the Super Rugby winning Canterbury Crusaders in New Zealand, said that he took a bit of flak last year for comparing Carbery to All Blacks fly-half and two-time World Rugby Player of the Year Beauden Barrett, but after watching Ireland's 22-13 win over Scotland on Saturday, he stood by the comparison and insisted that he still has a lot of room to grow and improve. "I got slagged off 12 months ago for comparing him to Beauden Barrett but I genuinely see that star ability in him," O'Gara said on Virgin Media One. "I think he's 23 years of age and imagine what he's going to be like in three years time if he continues this progress. "He just makes look the game easy in play. 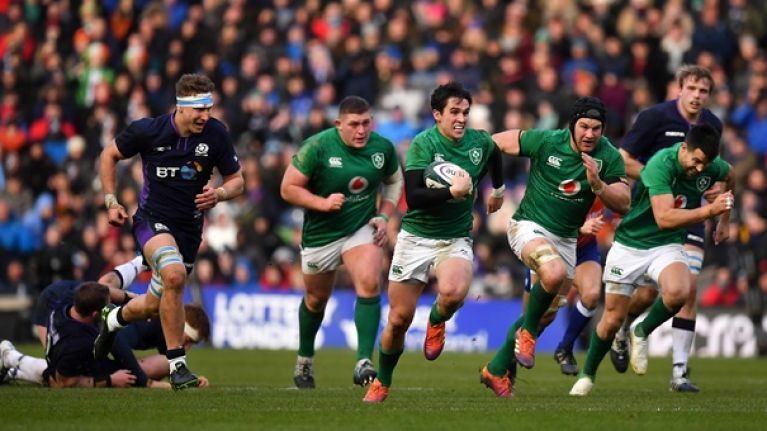 Dave McIntryre summed it up; that break was the best piece of play all day and his capacity to process that decision making and make it look easy for Earlsy [Keith Earls]; the ball was kind of going in slow motion through the air. There you go Earlsy, touch that down for me would you? "The great thing about him is that he never seeks safety or comfort on the ground like some people do. In open spaces he gets really excited. You can see that he's most comfortable with ball in hand and it's the kicking he needs to probably work on." O'Gara noted last year that he has similar acceleration to Barrett while Nick Winkleman, head of athletic performance & science for the Irish Rugby Football Union, previously identified Carbery as the one Irish player he thinks could make the transition to the NFL. "You've seen where he glides and can change a game. He has the same acceleration as Beauden Barrett," O'Gara said last year. "It's a great attribute to have. But he needs to get better at his game management. "What's important is that people have recognised that Joey's a very good player, so he's going to get time in the jersey. And you get better, the more time you get in the no 10 jersey for Munster. "So he needs to play games. If I was the coach, it's probably his (jersey) to lose now. You have to give him the chance to grow - he's proven for Leinster and Ireland.